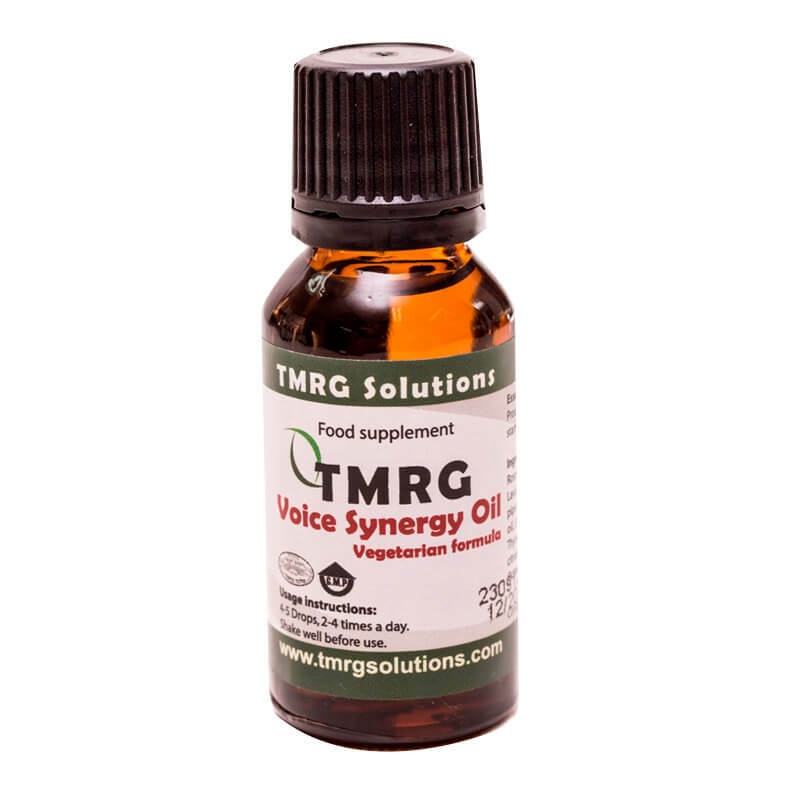 Suitable for: The Voice Synergy Oil is a herbal voice remedy beneficial in the case of extreme hoarseness, inflammation, vocal fold lesions such as (cysts, edema) and voice loss and urgent vocal distress. Description and effects: This product is a herbal voice remedy acts as a vocal ‘disinfectant’ and helps assist in the recovery of vocal infections and promotes healthy, clear voice production, by helping to reduce inflammation on the muscles around the vocal folds. This herbal voice remedy also protects against and mitigates the effects of acid reflux on the vocal folds. Overusing the voice is the most common cause of hoarseness. Overusing the voice creates tension and spasm of the muscles in the area. How to use: Shake before use. If severely / chronically hoarse or before performing, mix 4-5 drops in a ¼ glass of water (a bit of honey can be added, “Manuka honey” is highly recommended), gargle and swallow. Use as needed up to 4-5 times a day. In the case of acid reflux – one drop at the back of the tongue (before and after each meal) is recommended. Storage: Dry, cool and shaded place (not to be stored in direct sunlight). External use: Wash and clean the throat are around the Adam’s apple. Apply 3-4 drops two or three times a day and massage gently without applying any pressure. Gently move the Adam’s apple from side to side. It is suggested to use the oil prior to intense vocal use, for example, when performing extreme vocal styles such as ‘heavy’ rock music or prolonged vocal use or several hours of continuous talking. Four to five drops of Voice Synergy Oil can be beneficial in conventional steam therapy – simply pour boiling hot water into a bucket and inhale the steam whilst covering your entire head with a towel. This creates a feeling of cleansing and clearing of the nasal passages and respiratory airways. I am a professional live and studio vocalist. When my acid reflux became so terrible that I lost my voice for almost a year, this product helped bring it back to life. 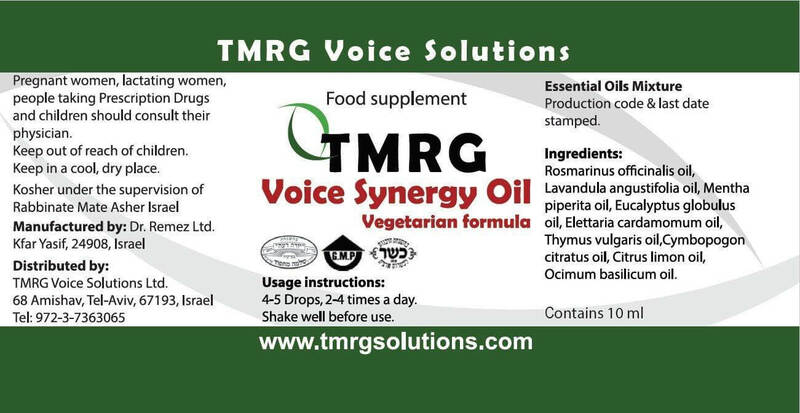 Love all the TMRG products but saw phenomenal improvement with the Voice Synergy Oil. I take it after meals and couldn’t imagine doing a gig without it!